↑Thomas A. Edison (SSBN-610), date and place unknown. Image courtesy of NavSource. ↑Cut out/cross section of the Ohio Class. Image courtesy of NavSource. 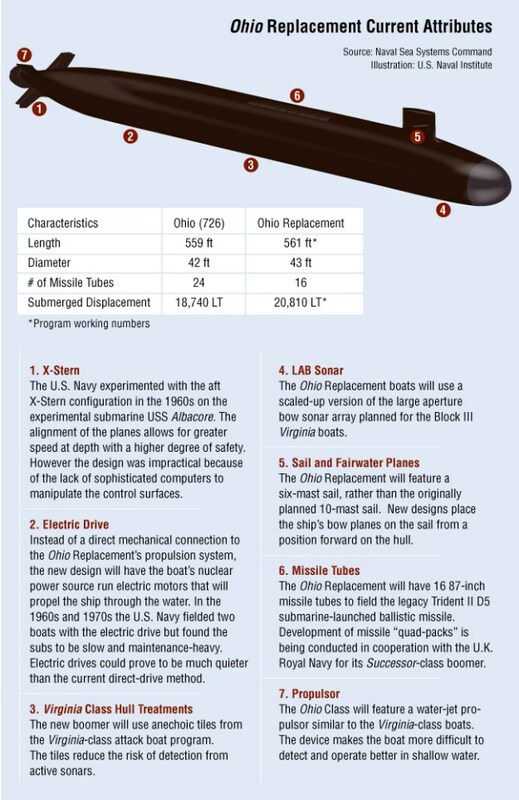 ↑Cutaway of Ohio class ballistic missile submarine (SSBN). Image: unknown. Image courtesy of Naval Analyses. ↑The current SSBN 726-Class antenna suite has two multifunction masts (OE-207/BR) for communications at periscope depth. The OE-207/BR multifunction mast provides the same communications capability as the AN/BRA-34. The difference in the two masts is the length of the OE-207/BR for integration into the TRIDENT sail. TRIDENT submarines are scheduled to receive the AN/USC-38(V)1 EHF terminal with the Type 8 Mod 3 periscope EHF antenna. The SHF/EHF HDR multiband antenna, when developed, will be added as a new mast. This class of submarines also has the OE-315 HSBCA. The SSBN has two AN/BRR-6 towed communications buoys. Figure A-8 shows the layout of the current baseline SSBN 726 sail. Image courtesy of FAS. ↑Life Aboard US Navy Ballistic Missile Submarine USS Wyoming - In Stunning 4K. AiirSource Military. ↑In March 2016, the Navy announced that General Dynamics Electric Boat would be the prime contractor for the class. Image courtesy of USNI news.